Ask fellow campers about "Villas Tortuga Cabanas & RV Park" and nearby attractions. This little park is very nice. There is now an infinity pool and a full service restaurant. The food is delicious and the atmosphere is great. The park is right on the Pacific and has its own beach. It is quite small and friendly. It did not have Wi-Fi, but the owner's wireless modem was available for use if needed. Not the best Internet setup, but still OK for emergencies. All in all we loved staying here and highly recommend it anyone traveling in the area. Great stop on the way to Mazatlan. We camped at Villas Tortuga Cabanas & RV Park in a Motorhome. We stayed in the park for one week, it is the most peaceful park we have been in mexico. The owners live on site and since there is only 8 sites it is not crowded. The villas being built will mostly be used at Christmas and Easter by nationals. The washroom and shower are very clean. If you ask the owner Eugenia will cook you diner with fish you have purchased from the fishermen on the beach. We were able to get our e-mail using Villa Celeste resort wi-fi. According to the owner a pool will be built . We enjoyed our stay so much that we reserved for 5 months next winter'. Six of the 8 sites are already reserved. 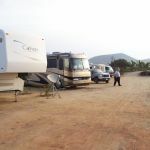 We camped at Villas Tortuga Cabanas & RV Park in a Motorhome. 23.80539N, 106.88066W This facility is really aimed at renting their villas, but they have eight RV sites. It opened in February 2009, and they were still building villas and had not yet built the swimming pool when we were there. Easy access for any size rig, but some sites are quite unlevel and two or three of the sites not big enough for a big rig. Very nicely landscaped grounds. No landscaping around the RV sits, which are decomposed granite, though. The sewer connections were uphill for any RV with a low dump valve like ours. High voltage; it was 136 VAC in the morning, falling to only around 120 under heavy loads in the afternoon. Very attractive palapa with restaurant and bar. Excellent beach--clean sand and nice surf. Shower and bathroom (one each) were spotless. They even provide a towel and robe in the shower. Internet access consisted of a cellular dongle that the owner loans to customers. Two of us that tried it (one with XP one with Vista) couldn't get it to work. We camped at Villas Tortuga Cabanas & RV Park in a Motorhome. Are you affiliated with Villas Tortuga Cabanas & RV Park ?